Golden tilefish inhabit deep (80-400 m) waters along the east coast of North America. Annual landings in the 2000s ranged from 1,000-2,000 mt (with ~90% caught by bottom longline) and all stocks along the eastern US are currently healthy and not overfished. The gears used to catch golden tilefish have minimal impacts the surrounding environment; however, bycatch impacts differ by region. Golden tilefish are managed by three different regional agencies, all of whom have highly effective management plans that follow scientific advice. All regions have up-to-date stock assessments and apply appropriate annual catch quotas. Bycatch management is also largely effective. Golden tilefish have a medium inherent vulnerability based on their life history traits. The abundance and fishing mortality of this species along the eastern US is of very low concern as stock assessments state that the stock is not overfished and overfishing is not occurring. However, there is uncertainty surrounding fishing mortality in the Gulf of Mexico, although this population is also not overfished at present. Handlines and bottom longlines are quite selective, however some bycatch does occur. No species of concern are caught in the mid- and southeast Atlantic, but loggerhead turtles are caught by bottom longlines in the Gulf of Mexico. The Mexican population of this species is classificed as ‘threatened’ by the Endangered Species Act, and interactions with bottom longlines primarily result in turtle fatalities. Handlines are used to target fish in the water column and thus they have no negative impacts on the seafloor. Although bottom longlines do come into contact with the benthic environment, golden tilefish live primarily in regions with fine sand, silt and mud bottoms. As such, this gear has a low impact on the substrate when fishing for tilefish. 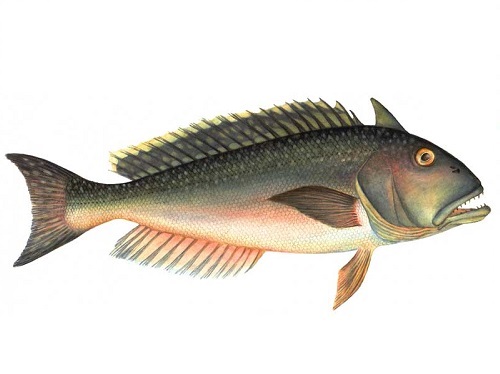 Blueline tilefish are found in water between 50-200m in depth from the coast of Virigina down to the Gulf of Mexico. Landings are currently quite low, with 100- 200 t caught annually since 2010 (the majority being taken by bottom longline). The southeast stock is currently classified as overfished, and very little population information exists for the Gulf of Mexico stock. Blueline tilefish are managed by two different regional agencies, both of whom have highly effective management plans that follow scientific advice. While an explicit rebuilding plan for the southeastern stock exists, it has yet to be implemented due to amendments to abundance and fishing mortality estimates in the most recent stock assessment. Blueline tilefish have a moderate inherent vulnerability based on their life history characteristics. The most recent stock assessment classified the southeastern Atlantic stock as overfished with overfishing continuing to occur. Blueline tilefish are not believed to be overfished in the Gulf of Mexico, however no stock assessment for this region exists and landings there have fluctuated substantially over the last three decades. Handlines and bottom longlines are quite selective; however, some bycatch of species of concern does occur. In the southeast Atlantic, the ‘critically endangered’ speckled hind and other threatened groupers are among the bycaught species. The ‘critically endangered’ warsaw grouper, and loggerhead sea turtle are caught by bottom longlines in the Gulf of Mexico. Interactions with bottom longlines primarily result in fatalities for these species. Handlines are used to target fish in the water column and thus they have no negative impacts on the seafloor. Although bottom longlines do come into contact with the benthic environment, blueline tilefish live primarily in regions with fine sand, silt and mud bottoms. As such, this gear has a low impact on the substrate when fishing for tilefish.